The Edit button on the righthand side of the track shows/hides the track's editor. The editor can show the MIDI notes in three different ways: Pianoroll, Score and Drum. The tabs on the right (Piano/Score/Drum) can be used to switch between these editors. 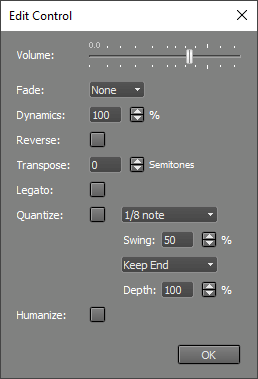 The default editor is Pianoroll, this can be changed in the Preferences window. All three editors can edit MIDI as if it were audio, and they can edit the MIDI notes themselves as well. This section deals with editing MIDI as if it were audio, the next sections cover editing notes and controllers. At the bottom of the editor the common track editor buttons appear (see Common track editor buttons). Editing actions, like paste, delete or undo, affect both notes and controllers. MIDI edits are not written to disk immediately. When a track is closed (this also happens when the song is closed) a window appears asking whether to save the changes or not. If you want to save the changes explicitly you can use the File Options Menu's Save option. MIDI tracks have built-in scrubbing features similar to audio tracks. The MIDI Edit Control, invoked by clicking the editor's Edit button, can be used to manipulate the selected part in various ways. Volume fader: Changes the volume of the selected part. Dynamics: Compress (0..100%) or expand (100..400%) the dynamic range of the notes. Transpose: Transpose all notes in the selected part by a number of semitones. Legato: Note durations are adjusted to make note-to-note transitions smoother. Can be used to make 'smooth' instruments like violins sound more natural. Quantize: Notes that are slightly too early or too late are moved towards the correct positions. The amount of correction can be from 5% up to 100% ('hard quantizing'). The box below the "%" box sets the resolution. Normal: 1/1, 1/2, 1/4, 1/8, 1/16 or 1/32 note. Swing: 1/8 or 1/16 note. The 2nd, 4th, 6th (and so on) notes of a bar are delayed. The swing percentage can be 52..71% (50% means "no swing"). Triplet: Triplet of 1/4, 1/8, 1/16 or 1/32 notes. Full: quantize both note-on and note-off. Keep Note-Off: quantize note-on, don't touch note-off. This is the default type. Keep Duration: quantize note-on, move note-off to keep duration the same. Humanize: Shifts note events a (small) random amount of time, and changes the note volumes slightly.